The telvision company, Al Jezeera accompanied this tour and put this video out on their network. Take a look and come and join the tour. 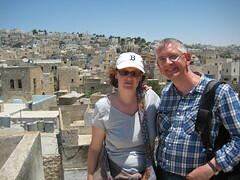 Our tours to Bethlehem and Hebron are a mix of visiting historical and religious sites, and meeting people. If you want to rush from site to site and cram in as much as possible then this tour is not for you. The guide is a resident of Bethlehem with deep knowledge of his society and culture. He has relationships with a wide variety of people in Hebron, and is open to all kinds of questions. You'll be picked up with the group in Jerusalem at one of our designated pickup locations. Pickups from Tel Aviv or other locales can be arranged. 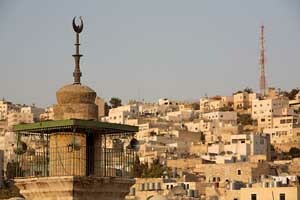 Then the group will be driven to Bethlehem to pickup the guide, and continue to Hebron. Enroute you'll see many Jewish settlements and some lush Palestinian countryside and farms. You'll enter Hebron through one of the few roads still available to Palestinians. Most of the roads have been closed by the Israeli authorities. The morning will be spent in Hebron, then lunch, and the afternoon will be spent in Bethlehem. You'll be returned to Jerusalem to the pickup location. However the driver is flexable. If you want dropped off, en-route into Jerusalem he'll oblige.